A removable partial denture is designed specifically to meet the needs of the patient and can replace one or more missing teeth. A natural appearance is restored along with the ability to eat more efficiently. Your partial denture is designed so that the chewing forces are evenly distributed over the entire surface are of the remaining teeth and soft tissues. Small changes to your remaining teeth may be recommended to help equalize these forces. Metal partials are generally are preferred as they are structurally superior. They are thinner and more hygienic than an acrylic partial. Acrylic partials are typically used as a transitional or temporary partial. 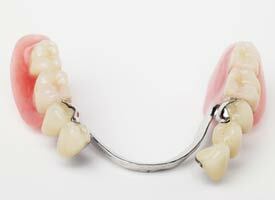 A removable partial denture may help limit drifting of your existing natural teeth when the neighboring tooth has been lost or removed, while also improving both appearance and speech.